Which method is best to monitor noise: sound level meter or noise dosimeter? Our work environment has been transformed since the 1970’s with the introduction of new machinery and technical equipment designed to improve and increase general productivity. This has revolutionalised the way we operate during a typical working day creating employees that are now more mobile. This is particularly true of production lines in the automobile industry and construction workers operating multiple tasks in different areas at short notice. The single work station is a thing of the past and the variation in individual noise exposure follows these work pattern changes. Traditionally, sound level meters allow health and safety professionals to measure accurately the noise level exposure by following staff as they work and, by repeating the process over a day, to obtain an average of the exposure. 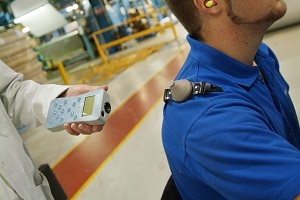 Noise dosimeters or personal sound exposure meters (PSEM), which are mostly worn on the body such as, for example, on the shoulder, and left to operate for an 8 hour shift, have an important role to play in calculating daily complex noise exposure levels in various situations, especially where workers are operating in difficult to reach situations. A sound level meter, also known as noise meter or decibel meter, is a hand-held device that is used by safety professionals to take measurements by standing close to the source of noise and by pointing the meter close to the employee’s ear (10-15 cm approx). 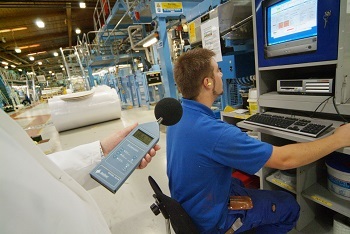 A typical example of industrial noise measurement made by using a Pulsar sound level meter is shown in the picture on the right. Sound level meters are used to meet compliance with Noise at Work regulations (2005) in the UK as well as other Health and Safety regulations such as OSHA or the EU Directive 2003/10/EC. It is paramount that safety professionals use a compliant sound level meter to make any workplace measurements in order for their noise assessments to be valid and protect the business against costly future claims. Compliant Sound Level meters conform with IEC 61672-1, the international standard that completely specifies their performance. It is worth noting that a number of very low-cost sound meters on the market at present cannot possibly meet this standard and are still allowed to imply compliance in many countries around the world. Buyers beware! A noise dosimeter or personal sound exposure meter (PSEM) is a specialised sound meter intended specifically to measure the exposure to noise of an employee that has been integrated over a specific period of time. This method is also used by employers to comply with current occupational regulations. These regulations include ‘Noise at Work’, OSHA and the EU Directive 2003/10/EC. Noise dosimeters, available in most countries, are manufactured in compliance with IEC 61252:1993 & ANSI S1.25:1991 which are the current International standards for dosimeters. A noise dosimeter normally follows the tolerances of a ‘Type 2’ sound level meter in terms of general performance due to acoustic measurement and this is thus acceptable within the required accuracy for workplace noise regulations. These tiny devices have a number of advantages. They have a limited effect on the sound field and in the case of the Pulsar’s noise dosimeter, have no cable interfering with the worker’s physical environment. A noise dosimeter such as the Pulsar Model 22 doseBadge system is a tiny rugged self-contained device which can be clipped to the lapel or collar. See the pictures on the right for typical examples of uses. The noise dosimeter doseBadge can also be screwed on a hard hat using a helmet mount commonly used the construction industry to provide the wearer with added peace of mind. The noise dosimeter can then be started at the beginning of the shift with the help of a dedicated ‘Reader’. The Reader such as the Pulsar Model 22-R will also calibrate the noise doseBadge, a process which is recommended before and, ideally, after use to validate any measurements. Throughout the day, the doseBadge will measure all noise levels and will compute the LAeq and LCPeak values over the whole measurement period. At the end of a shift the noise dosimeter’s Reader is then pointed to the noise doseBadge, and, wirelessly, measurements are downloaded and perused easily on the Reader’s LCD display by using the keypad navigation arrows. All measurements can be then be transferred onto a PC via a dedicated software package such as Pulsar dBlink3 to produce a plotted Time History of noise events during the day without the need of complex manipulation for reporting purposes. We hope you now have a better understanding of the noise dosimeter method of measurement of exposure to noise at work. If you want more information and advice on how to control your employees' exposure to noise at work with noise dosimeters, or wish to purchase a compliant noise dosimeter that is suitable for occupational noise monitoring applications, why not call Pulsar Instruments on 01723 518011?